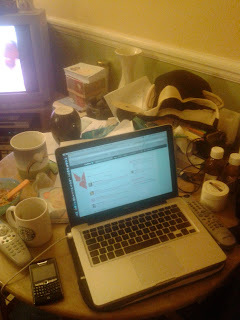 I am taking part in Multiple Mummy's "where do you blog?" meme. And am slowly, ever so slowly resuming my blogging regime. The meme on this ocassion originated with Bibsey asking if we are Saint or Slattern. Yeaaaahhhh that's me! And my husband would agree! I did not want to entitle this post "where do I blog?" as (1) it is too boring and (2) er, the photo will explain and (3) the where do I blog meme did the rounds a few months back (I remember SAHM Loving It's gorgeous room in her garden - ooooh how I coveted that :-) ), so I wanted to call it something different. - errrr no, cos there aint nuffing clean about it. - errr no, cos it hasn't and I am still avoiding life and on my treadmill of blah blah blah. - that's the one! That fits. If the cap fits and all that! As you can see I can blog and watch TV at the same time.